To get Eastern State Penitentiary to where it is today—a museum that both provides an account of the history of prisons in the United States while also addressing current concerns with incarceration—has been a long time coming. 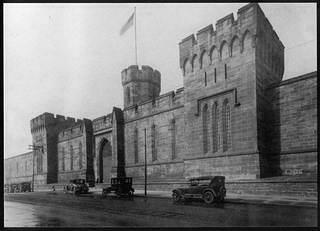 About 75,000 inmates passed through the Philadelphia prison from 1829 until it closed in 1971. Over the next two decades, it sat abandoned and neglected as the city determined alternative uses for the site. 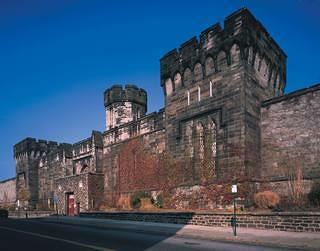 Finally, in 1994, its future looked secure and the Pennsylvania Prison Society opened Eastern State’s doors to the public while the society formulated a plan for its preservation. “The perimeter walls are 30 feet tall. They hide what’s going on inside, so people had forgotten the history of it, what it represented, the early period of the country. They didn’t realize it was built for prison reform. It’s a powerful building,” says Sally Elk, CEO and president of Eastern State Penitentiary Historic Site, the nonprofit that took over the prison in 2001. From the outside, the prison today looks much like it did decades ago. 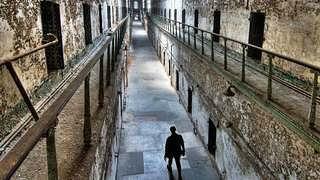 Eastern State is infamous for holding notable criminals like Al Capone and for its supposed haunted corridors, but these are just two of the reasons visitors are drawn to the sprawling prison. Others are intrigued by the current state of the prison—a stabilized ruin. Elk explains that the reason for choosing stabilization over a full restoration was practical. While this unique approach was chosen for financial reasons, the prison's current architectural state serves as a perfect canvas for interpretation of the site and its significant history. John Haviland designed the prison in the early 19th century during a period of history in which many were reconsidering the purpose of prisons and prisoner conditions inside. Prior to the admittance of Eastern State’s first prisoner in 1829, the American jail system was riddled with problems, from overcrowded cells to rampant disease passed between prisoners, to start. Not too far from where the prison would be built, the Philadelphia Society for Alleviating the Miseries of Public Prisons (founded by well-known Philadelphians including Benjamin Franklin) agreed that the best sort of prison would be one that reformed its prisoners by providing workshops and separating prisoners based on gender and crime. Haviland designed Eastern State like a wheel, with seven cell blocks radiating from a center core, all surrounded by a wall. Prisoners were kept isolated in individual cells that opened in the back to separate exercise yards. The front of the cells opened onto a corridor, but prisoners could not enter. The door that separated prisoners from corridors was a small feeding door through which they would be given food three times a day. This method of isolation was meant to encourage penitence in prisoners and reform them from a life of crime. Alongside the fledgling United States, governments overseas were examining prison reform too. Officials from England and Russia visited Eastern State before it opened in 1829, taking back plans to build their own. 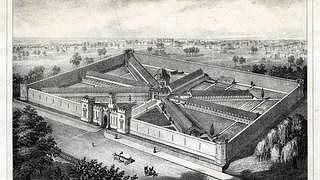 About 300 prisons across the world were constructed from Eastern State’s plans. The restored synagogue at Eastern State. A circa 1855 lithograph of Eastern State Penitentiary. An inmate painted religious murals on the walls of the Catholic chaplain's office. While most of the prison looks as it did when the nonprofit acquired it in 2001, several spaces in the prison have been restored. The synagogue, built in the 1920s, is one of them. “We learned through research that there was an outside Jewish community that visited the prison and counseled Jewish inmates, helping them maintain their faith and celebrate holidays,” Elk explains. 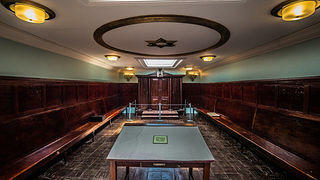 “The chairman of the trustees at the time was Jewish, and he promoted a synagogue. He died suddenly in 1928 and the inmates memorialized the synagogue in his name.” This history alone was compelling, but the synagogue maintained enough of its original architecture and remnants of the decorative ceiling that enabled the museum to do a full restoration. About three quarters of the prison is currently open to the public. The plan is to open more in the future once the museum has the financial means to do so. One space that may open is a two-story building with an auditorium on the top level. In this space prisoners would attend Catholic mass and Protestant services, watch movies and listen to concerts, and use it as a gymnasium. Elk hopes they can use the space for public gatherings. The National Historic Landmark isn’t simply a prison frozen a time, a remnant of the past that's irrelevant today. “When our organization became a 501(c)(3) in 1998, we adopted a mission statement to preserve the site, open it to the public, interpret its history, and to place the issues of today’s criminal justice system in context with the history,” says Elk. The first three goals consumed the majority of work for the museum. However, in 2012, they changed gears and created an interpretive plan to explain current issues in the criminal justice system. 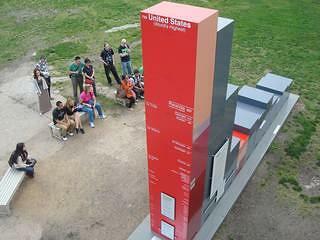 "The Big Graph" shows incarceration rates worldwide compared to those in the United States. 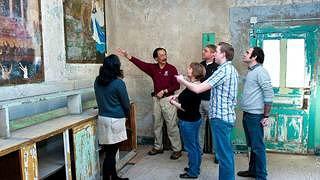 Whether a person chooses to visit Eastern State Penitentiary for its stabilized yet haunting architecture or for the way it presents a bigger picture of America’s criminal justice system, visitors will undoubtedly leave with a more coherent understanding of how the country has addressed prisons and prisoner reform through architecture and laws.